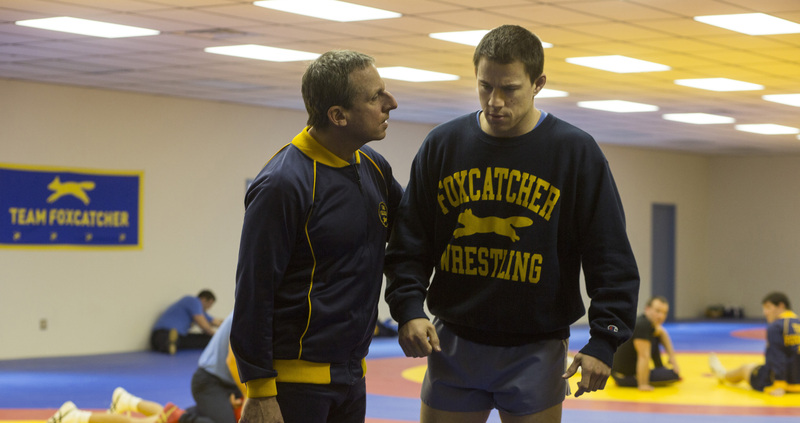 A Look at Foxcatcher | What Else is on Now? It shows one man’s obsession to live out fame through his team as they prepare for the Seoul Olympics. It’s a well made drama with great performances from the three leads and a big departure from what I would normally expect from Channing Tatum and Steve Carell. Let’s jump right in. The film begins with two dummies. 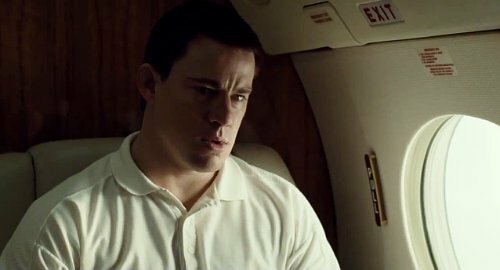 I mean, the film begins with Channing Tatum wrestling a dummy. 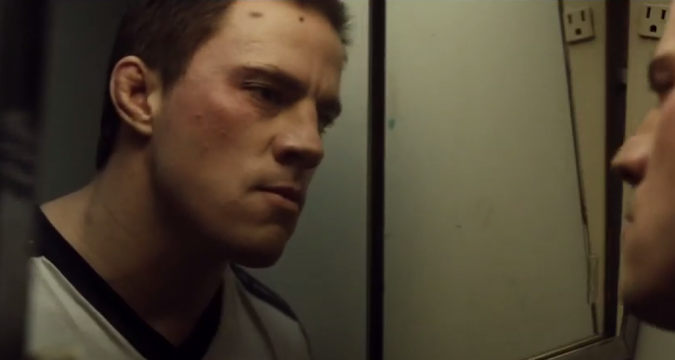 Tatum’s character, Mark Schultz, is a wrestler. After a brief sparring match, he dons his gold medal and heads to McKinley Elementary School for some good old fashioned motivational talk. His audience of kids is less than enthused. Mark tells the students about how he won his gold medal at the XXIII Summer Olympics in Los Angeles. This medal represents who he is and what he stands for. Moving stuff, really. When Mark goes to collect his check, he’s initially mistaken for his brother, Dave, who had originally been scheduled to speak. Easy mistake to make. They did both win gold medals. Later, Mark heads to the gym to train and finds his brother, Dave, played by Mark Ruffalo, talking to some representatives from U.S.A. Wrestling. Once the reps leave, Dave and Mark get some training in. While the sequence does play out a bit, I do like how methodical the two get when they practice. Mark goes a bit too hard and headbutts Dave in the nose. All the same, the practice continues. That evening, as Dave drops Mark off, Mark asks why the representatives from U.S.A. Wrestling stopped by. Turns out that they discussed coaching wrestling in Colorado. Mark soon receives a phone call on behalf of a man named John du Pont. This Mr. du Pont wants Mark to meet him at Foxcatcher farm to discuss a certain matter in person. When Mark arrives, he’s left to wait for du Pont, who has been called away to provide tactical support for the local police department. He makes his way around the fancy estate until it’s time to meet the man himself: John du Pont, played by Steve Carell. The two talk and John admires Mark’s confidence. That, he feels, is the most important element before a match because you go in knowing that you can win. Du Pont himself is a coach and he loves the sport of wrestling. He talks about Mark’s future and what he wants to achieve. So what does Mark want to achieve? He wants to be the best in the world. To help, du Pont offers to train Mark for the 1988 Summer Olympics in Seoul. Du Pont shows Mark around the farm, including a look at Team Foxcatcher’s training room. Du Pont wants to stun the world in the Seoul games, but du Pont is on about more than that. He’s a patriot and patriots gave up all they had for freedom. Men like him and Mark must always remind themselves why that matters. Mark tells Dave about his meet with du Pont. He’s ecstatic. Du Pont is going to pay him $25,000 a year. Why that amount? Well, it was the largest price that Mark had in his head at the time. Huh. Mark wants Dave to join him, though Dave is curious as to what du Pont will get out of this. The answer is simple: winning. Even still, Dave is hesitant to jump on board. After all, he still has to be there for his wife and kids. Mark, however, doesn’t want to pass up this opportunity. So Mark moves out of his home and into Foxcatcher estate. He meets with Henry Beck, played by Guy Boyd, and answers some questions about his background: undergraduate education, whether he owns property and how he’d been raised by his brother. Mark and Dave’s parents split when Mark was three. While receiving another tour, Mark spots some horses. These belong to John’s mother, Jean, played by Vanessa Redgrave, who is off limits, as is the big house. If Mark ever spots Jean, he needs to respect her privacy. As the day goes on, Mark passes the time by watching a VHS tape on du Pont history. That evening, John shows up at Mark’s door and gives him a pair of binoculars for watching birds. More important, he tells him that there are less than two months until the World Championships. Mark promises to give all he has. 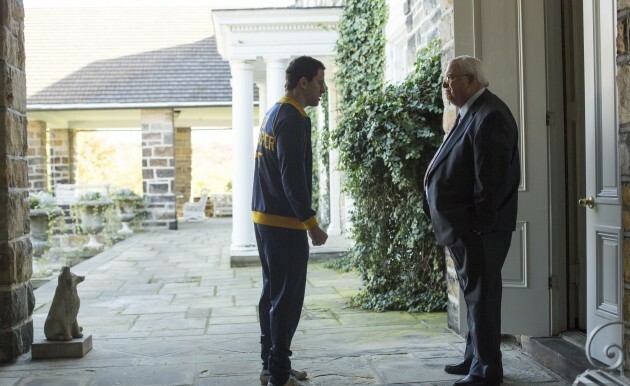 The next day, John introduces Mark to the rest of Team Foxcatcher. After a bit of training, Mark meets up with John in his office. John asks about Dave, as he’s still interested in both of them joining the team. Mark tells John that Dave isn’t willing to join, regardless of however much money John offers. Soon enough, it’s time for the 1987 World Wrestling Championships in Clermont-Ferrand, France. Mark wins his match handily, as does Dave. Following this, Mark formally introduces John to Dave and his family, but the meeting is brief. When John leaves, Mark chews out Dave’s wife, Nancy, played by Sienna Miller, for not saying hello to John, even though she did. Mark says that Nancy doesn’t even know. She just doesn’t know, man! John is a patriot. He and Dave have a sidebar in the hallway. After Mark wins his next and final match, Team Foxcatcher celebrates in du Pont’s trophy room. Du Pont calls for calm so he can talk for a bit. On one shelf are some horses. He has them removed because he finds them silly. As much as John loves his mother, he does not share her love for horses, the same way she does not share his love for wrestling. At least it all balances out. He has medals put on the shelf in place of the horses. While du Pont shoots with some officers, Team Foxcatcher continues to train. Mark is then called into John’s office and given a check for $10,000. Mark initially does not accept it, but John says that he earned it. More than that, he tells Mark that he is so much more than just Dave’s little brother. Yes, Dave was a good and inspiring mentor, but Mark will always be known as the younger brother who can’t be all he can be because Dave won’t allow it. Now, Mark no longer has to hide in Dave’s shadow. It’s time to distance himself. Mark is grateful to John for his kind words. John, though, prefers that instead of being called sir, wants Mark to refer to him as Eagle or Golden Eagle. Well, then. Just 387 days to go until the Seoul games! 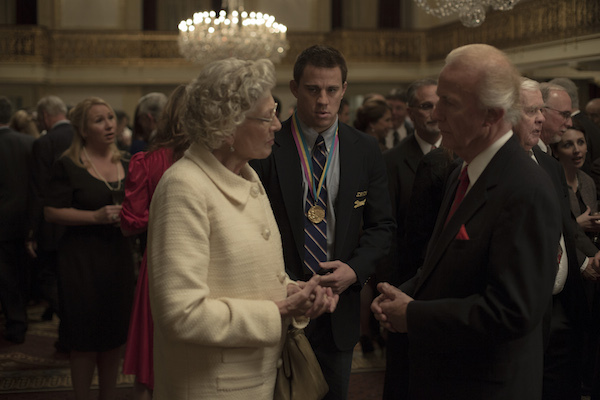 I think one of the main themes I grasped from Foxcatcher was tragedy. Mark Schultz is a man who achieved great fame through his win in the previous Olympics, but his life is one of solitude and loneliness, the only companionship coming from his brother, whose charm is helped by Ruffalo’s performance. Du Pont is a man whose past his prime, but still wants to capture America’s glory through his team. This, I feel, goes hand in hand with the film’s tone, as there are a lot of muted colors throughout. To be honest, I had not heard of or followed the real life story this film is based off of, and if you don’t know how that one ended, I won’t spoil it for you, because I do think the film is worth seeing. There are some changes to the history here. For example, Vanessa Redgrave’s character had already died around the time most of the film’s events take place. That particular change doesn’t vex me, but it’s worth noting that the directors did alter a few things. Director Bennett Miller, also responsible for Capote and Moneyball, knows how to pace his film well, yet there are a few moments where the movie could have benefitted from some trimming. 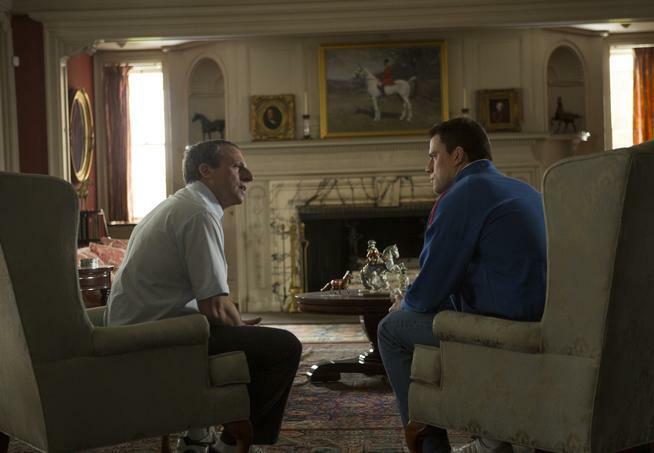 When Mark first arrives at Foxcatcher farms, there are long scenes of him exploring the mansion. I understand these moments help establish how different Foxcather is from his small world, but I think they just went on a bit too long. There’s a lot of focus on America as a whole: what makes the nation great and how we try to show our dominance over other nations. If du Pont’s talks about America were any more red, white and blue, you’d start hearing the narration from the “Morning in America” political ad. To be fair, this does help establish who du Pont is and why he wants to showcase what he has to offer at the Olympics by having his team represent the nation. I get the feeling that du Pont himself did not get that much support, but doesn’t want that same lack of backing to befall his wrestlers. During his efforts to recruit Mark, John talks about how the Soviets back their own, but America failed to honor what athletes like Mark did for his country. Another big focus of the film is proving your worth. John preys on Mark’s insecurity and how he’s lived in his brother’s shadow for so long. Not that there’s any sibling rivalry, but Mark clearly got the shorter end of the deal: Dave has a loving wife and two kids. Mark lives alone, eats noodles and plays with his Game Boy to pass the time. At the same time, du Pont strives to receive acceptance from his mother- something he never gets. She calls wrestling a low sport and doesn’t like seeing him low. What little screen time she’s given, Vanessa Redgrave turns in a good performance. Really, everyone is on their A game in this film. Dave is easy to get along with and doesn’t seem to have a mean bone in his body. Ruffalo makes him so likable that I didn’t even want him to join Mark over at Foxcatcher. After all, he had a pretty good life and family. No need to give that up. But he’s more than just a nice guy. Dave is a leader and not the boasting kind. He treats wrestling very seriously and will take as much time as possible to go over techniques and fundamentals with his brother or anyone else he trains. I bought that he would be the one to bring Mark up after their parents left. Dave is not a man who can be bought by money, which is why du Pont tries even harder to rope him into Foxcatcher. But aside from the training, one of Ruffalo’s best moments comes from later in the film when Dave is asked by a documentary film maker to call John du Pont a mentor. I won’t get into specifics, but John and Dave have a rocky relationship that doesn’t really smoothen out by film’s end. To call du Pont, a man whose behavior toward Mark is questionable, his mentor is difficult to swallow for Mark and that’s very clear on Ruffalo’s face. 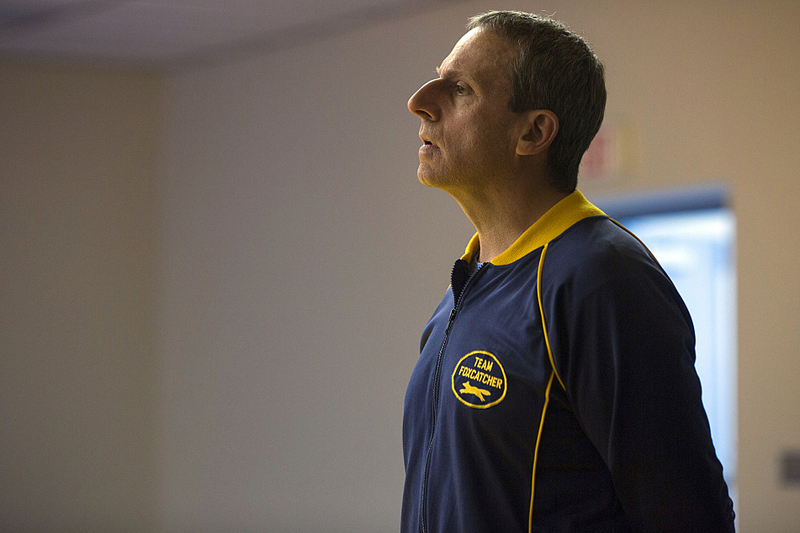 Then we’ve got Steve Carell as John du Pont. Carell drops any of the humor we’ve come to know him for, whether from The Daily Show or The Office, just to name two. This is a big departure from the comedic roles we’re used to seeing him play and becomes a completely different person. Here, he has a great, commanding presence as du Pont and though he’s soft spoken, there’s real authority in his voice. We don’t really dig much into du Pont’s head. We know his passion, but that’s because he tells us and the plot demands it. Whenever du Pont is on screen, I got the vibe that something was just off about him, but couldn’t nail down what that was. He has a massive hard-on for firearms. There’s a scene where soldiers deliver a tank to his residence, but John won’t accept the tank because the 50 caliber machine gun isn’t mounted on the tank. A tank alone is an intimidating sight, so he could have just taken that. I can’t say I’m sold on the makeup or prosthetics, though. Most people have called attention to it already, but that nose Carell wears is just distracting. As good as Ruffalo and Carell are, I think Channing Tatum impressed me just a bit more. Consider the opening scene: Mark puts his all into wrestling a dummy. He goes home and eats in solitude. He has very little social life and Dave seems to be his one companion. When Mark gives his motivational speech to the school kids, it’s almost as if he doubts his own words. He doesn’t really speak with conviction, even if he is proud of his gold medal. He’s a very sensitive, but lost individual. That makes him the perfect target for someone like du Pont. Foxcatcher mansion is unlike any place Mark has ever lived in and there’s real wonder in Tatum’s eyes as he explores every nook and cranny of Foxcatcher. As easygoing as Tatum is with his performances, there are moments where he shows great intensity. At one point in the film, Mark is well over the weight limit for an upcoming match. As such, he’s forced into a high speed regiment needed to burn off enough calories after a moment where he crashed and burned. I won’t spill what led to some of his self-destructive moments, but there was a lot of raw anger and frustration from Mark when he reaches some low points. All of those moments are handled well, thanks to Tatum’s performance. One of my qualms with the movie, however, is that Mark’s downward spiral comes a bit too fast and could have had more development. Foxcatcher is a tragedy. It’s about a man’s desire to become the best and how another man sought to take advantage of that. It’s about stepping out of another person’s shadows and becoming your own person. While du Pont may seem to have honest intentions, as the film unfolds, you see there’s something a bit more sinister with his plans. With strong performance from all three leads, Foxcatcher is an enjoyable film that I recommend people see if they have the chance. This entry was posted in Film and tagged Bennett Miller, Capote, Channing Tatum, Clermont-Ferrand, Dave Schultz, Film, Foxcatcher, France, John du Pont, Los Angeles, Mark Ruffalo, Moneyball, Seoul, Sienna Miller, Steve Carell, Summer Olympics, USA Wresting, Vanessa Redgrave, wrestling by omarid513. Bookmark the permalink.